Young leaders took to the Capitol on April 4 to urge Congress to act on climate change. The U.S. House of Representatives Select Committee on the Climate Crisis listened as they made their case that now is the time to take action in curbing the climate crisis. 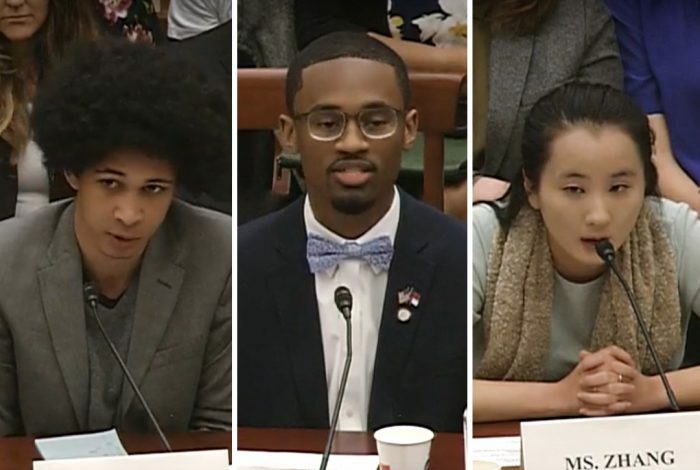 The hearing, titled “Generation Climate: Young Leaders Urge Climate Action Now,” is just one more event in the “Youth v. Government” climate change movement. Among the witnesses were Aji Piper of Seattle, 18, one of the 21 young plaintiffs of Juliana v. United States, a suit that accuses the United States Government of knowing, causing, and perpetuating climate change; Chris J. Suggs, 18, a student and activist from Kinston, North Carolina; and Melody Zhang, Climate Justice Campaign Coordinator, Sojourners; Co-Chair, Young Evangelicals for Climate Action. I saw climate change as a problem that would be solved by adults in nice suits in a faraway Capitol. But as I grew up, and the coal and oil trains kept rolling through my hometown of Seattle, and the oil tankers kept sailing in and out of Puget Sound, I became apprehensive. The late summer skies over Seattle now regularly fill with wildfire smoke, people walk around in gas masks, our ocean waters around my hometown are acidifying and rising, and yet there are still politicians in Washington, D.C. talking about climate change as if it is an issue to debate and still talking about promoting fossil fuel energy as if the pollution from that energy source is not dangerously destroying the one planet we’ve got, and the lives and futures of children along with it. I got to a point where I felt like I could no longer wait for the solutions to come from the Capitol or the adults that are responsible to protect young people like myself. “Our lawsuit [Juliana v. United States] makes a number of other claims, including that the United States government has a fiduciary responsibility to protect our public trust resources, such as the air, fresh water, the sea and the shores of the sea, not just for my generation, but for future generations as well. Read Piper’s full testimony here. Read Suggs’ full testimony here. “I had heard about environmental issues affecting people negatively, but in this period of my life I began to understand more fully what environmental injustice looked like played out in real time. It brought urgency to what I was learning in school in a way nothing else did. I was shaken at the reality of suffering I was witnessing and my heart broke for these people, my neighbors. Didn’t Jesus call us to love them, to look after their well-being? Didn’t he say, “whatever you do for the least of these brothers and sisters of mine, you do for me” (Matthew 25:40)? Read Zhang’s full testimony here.